To either side of the hardened path, a cold depth could surround you in snow to your waist, so you mind each step through the wood. 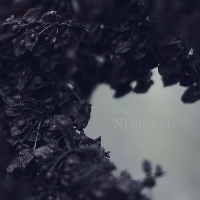 While Nebelung’s core sonics are those of dark, minor key folk – tense, yet yielding compositions – its strength and unsettling energy share boundaries with notes of melody and surrender. A stare passes between you and the ubiquitous (for this region) black squirrel, and for a second, shared emotions of wonder and care fill the divide between species. Present in each track, the cello creates a feeling of awe, wrapping the fulcrum of Palingenesis – that of steel-string and classical acoustic guitars – in beautiful accompaniment that eschews virtuosic performance in favor of the creation of connection. Scurrying up the paper birch, the animal mutters a stifled cry, but denies you a second glance. Wondering who has the better life, you move on toward the frozen waters. Non-intrusive spoken word helps to ensconse the mood firmly within the realm of melancholy; you will find little peace in its entreaties, but you will rediscover your own sense of empathy. The treeline breaks, and you gaze upon the the blue-green of the lake, smashing itself into frigid spray against little mountains of ice, trapping sand and shell beneath themselves. Glass harp, Indian harmonium, hammered dulcimer – all these and more concoct a vast expanse of sound, propelled by a sparse percussion that lends the album its primal air; a primitivism lent all the more grace due to its lack of electrical accompaniment, or any sense of sentimentality. In your mind’s eye you see yourself stepping over the icy overhang into the deep; neither hastily nor out of desperation, just with confidence that after this initial shock of temperature fades, a quiet like no other can be experienced there. The answer to a mysterious death endured by countless others awaits, but you will not be able to share its truth. The truth will be known only to you, and only for a moment. The accordion of closing track ‘Innerlichkeit’ – German for ‘inwardness’ – leaves one with a forlorn, yet resolute feeling that, though all our own tales will end in sorrow, we endure still: in story, in song, in whatever art form we use to express the inexpressible. Turning parallel to the brink, you begin to walk north with slower step; still searching. ~ by cliftonium on February 12, 2014. This entry was posted on February 12, 2014 at 8:35 pm and is filed under N-reviews.You can follow any responses to this entry through the RSS 2.0 feed.You can leave a response, or trackback from your own site.